Let’s face it. Trainers like to show off their horses. Whether it is the fastest timber horse, the best-conditioned endurance horse, that dressage horse who scores a perfect 10 on its final halt or that foxhunter who stands perfectly quiet at every check. The horse becomes a trainer’s best form of self-promotion. And yet, at this year’s Retired Racehorse Program Thoroughbred Makeover and National Symposium, well over 100 trainers from across the country, as well as Canada and the United Kingdom, came together with 165 retired racehorses to promote one thing: the Thoroughbred as America’s top sport horse. The Retired Racehorse Training Project (now RRP) was formed in 2010 by Steuart Pittman, Jr. of Dodon Farm (Davidsonville) along with a small group of friends. One year earlier, the group had hosted a symposium on retraining the racehorse; it met with such success that the nonprofit was formed to help trainers and owners transition racehorses into second careers. In 2011, RRP held a Trainer Challenge at the Maryland and Pennsylvania Horse World Expos. Then in 2012, the concept was expanded into the 100-Day Thoroughbred Challenge with horses provided by four top Mid-Atlantic Thoroughbred farms. The first official RRP Thoroughbred Makeover and National Symposium was held at Pimlico Racecourse in Baltimore in 2013 with nearly 800 people attending and thousands watching online. The Makeover and Symposium was held again at Pimlico in 2014. “The demand was there with all kinds of trainers wanting to participate,” said Pittman, current RRP president. “We needed to look into finding a facility that could handle the variety of disciplines and the large number of entries. Thus, the Makeover moved to the Kentucky Horse Park in Lexington, Kentucky. “The racing industry really is centralized in Kentucky and the Horse Park had plenty of space for us to use for the different tests,” Pittman added. The Maryland horse industry continued to show its support in a big way through the Maryland Makeover Founders Group as a major sponsor. This group included the Maryland Jockey Club, Maryland Thoroughbred Horsemen’s Association, Maryland Horse Breeders Association, Maryland Million, Maryland Horse Industry Board, Capital Polo Club, The Equiery, MidAtlantic Horse Rescue, Thornmar Farm, Sagamore Farm and Dark Hollow Farm. The trainers at this year’s Makeover came from 27 states, three Canadian provinces and the United Kingdom. Some trainers showcased multiple horses. Kentucky and Pennsylvania had the highest representation with 22 horses each, while Maryland was represented by 16 entries. Ohio and New York also had numbers in the double digits with Ohio having 14 and New York 10. Hailing from Maryland were Beverly Strauss of MidAtlantic Horse Rescue (Chesapeake City), Michelle Warro of Dodon Farm (Davidsonville), Allison Kraus of All in Stride Equestrian Center (Kingsville), Neil Agate of Capital Polo Club (Poolesville), Rumsey Keefe of Avalon Farm (Sandy Spring), Rebecca Walters of Pylesville, Jennifer Wayne of Chestertown, Jennifer Osterman of Potomac, Nuno Santos of Santos Sport Horses (Reisterstown), Jane Allen Blayman of Laurel, Colleen Rutledge of Turnabout Farm (Damascus) and juniors Jenny Searles (Gaithersburg), Elissa Ogburn (Crownsville) and Anastasia Vialov (Cockeysville). 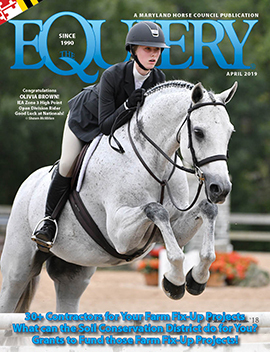 One such junior who made it into the top 10 was Anastasia Vialov, a former Jonathan Kiser Scholarship winner, junior jump jockey and show hunter rider. “I decided to enter in the hunters because that’s what I usually do and Vow had a very natural jumping ability from the start,” she said. Her entry for the Show Hunter division was her own Vow Of Honor, a 2009 Kentucky-bred mare by Broken Vow out of Lady Rushmoore. “I feel that my horse performed very well. She is used to having a lot of turnout and with being in a stall for four straight days, she had a lot of energy,” Vialov explained. Vialov and Vow placed 10th out of over 30 entries. “Only one other junior placed above us, which I was pretty proud of. Competing as a junior trainer against a bunch of professionals and adults was intimidating but it was also extremely gratifying when my horse performed as well as she did.” As a racehorse, Vow had 14 starts for three wins, two places and two shows for career earnings of $53,341. Trainers had their choice of 10 different disciplines: Barrel Racing, Competitive Trail, Dressage, Field Hunter, Eventing, Freestyle, Polo, Show Hunter, Show Jumper and Working Ranch. Some opted to enter their horses in a few disciplines while others focused on one particular discipline. Junior trainer Anastasia Vialov (Cockeysville) placed 10th in the Show Hunter division with her own Vow of Honor. Rumsey Keefe was a bit surprised at how many people chose to enter multiple disciplines, but stated, “The RRP organizers were very flexible in the schedule if you were doing many disciplines and the Midsouth Team Challenge [– USEA event].” She added that she focused on Eventing for Eighttofasttocatch because “with just [my daughter] Ryan and I here with no helpers it was tough to add more to our day.” Ryan was competing in the Midsouth Team Challenge Training Three-Day, which also took place at the Kentucky Horse Park that week. Catcher, Maryland’s millionaire entry, now owned by racehorse trainer and husband Timothy Keefe, is a 2006 gelding by Not For Love and out of Too Fast To Catch. He had a super successful career as a racehorse well into his eighth year when he won the Maryland Million Classic for the third time. “I felt a duty to represent Maryland with its star Not for Love offspring and to show that older, successful racehorses can have second careers, especially if managed well enough to stay sound and race happily through six years of racing,” she said. Not For Love was also represented in the Makeover by Jaded Lover, a New York-bred gelding who finished second in the Working Ranch Horse division with Dale Simanton of South Dakota. Each discipline had a series of tests and a panel of judges. The top three from the competition were invited back for the finale for a chance to earn additional points. Pittman explained that each test was created by the Makeover committee along with representatives from various organizations associated with each discipline, such as the Thoroughbred Barrel Racing Association and American Competitive Trail Horse Association. “The organizations really jumped in to help as they saw the Makeover as a way to promote their sports to the Thoroughbred industry,” Pittman stated. The RRP board selected judges, though many, like Bernie Traurig and David Hopper, approached RRP asking if they could serve as judges. “All [judges] said they would come back,” Pittman reported after the event. “Some said it was hard to judge as there was a huge range of experience among the trainers,” he added. 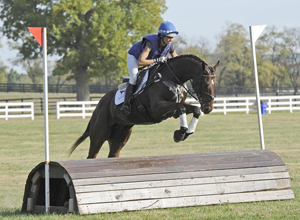 Colleen Rutledge of Turnabout Farm (Damascus) finished third in the Eventing division aboard Patricia Dale’s Your A To Z’s. Eventing professional Colleen Rutledge, who finished second in the Eventing competition portion with Your A to Z’s (by Your ABCS out of Me Little Kate) but dropped down to third overall after having to leave before the finale due to a medical emergency, also had some judging concerns. She stated, “While I believe in the idea, heart and goal of the program, it did not have the transparency of an actual competition.” The West Virginia-bred colt is owned by Patricia Dale and is only five years old. “I probably only had about 30 rides on him total between his last race and the Makeover so I am completely thrilled with his performance,” she added. The big winner of the Eventing division was the Maryland-bred Best Things InLife, ridden by Michelle Warro and owned by breeder Cynthia McGinnes. The 2011 bay gelding only had one start to earn $2,280 before being retired. He is by Majestic Warrior out of Calldara by Sultry Song. Warro and McGinnes had worked together before as Warro rode another McGinnes-bred, Strangerinthenight, at the 2015 Maryland’s Most Wanted Thoroughbred competition at the Maryland Horse World Expo. Warro also competed him in the Dressage division, scoring an overall average of 68.98% for third place. “The dressage judges liked his steadiness and attention,” she stated. After getting a week off and then a week of hacking, Freebie and Warro headed to Full Moon Farm Horse Trials as his first — USEA-recognized event. She is hoping to do the Young Event Horse 5-year-old program with him in 2016. In the Show Jumper division, it was the Maryland-bred gelding Feet Included who took home second place with owner/trainer Rebecca Walters. She was also the highest-placed amateur trainer in the division. The six-year-old Feet Included was bred by Glade Valley Farms, Inc. and is by Include out of Fleet and Fancy by Touch Gold. He had 37 starts with three wins, three places and one show for $37,745 in career earnings. Walters comes from a long line of racing horsemen with her father Henry Walters training out of Pimlico and her uncle David Walters at Charles Town. In the end, Dewey Square, ridden by junior Isabela de Sousa of Kentucky took home the win with Walters and Feet Included finishing second. “I would absolutely participate in the Makeover again! It was great to be a part of as well as to share my love of Thoroughbreds with a lot of other people,” she added. Although a Canadian Thoroughbred named Soar (by Trajectory out of Pyrenee by Mt. 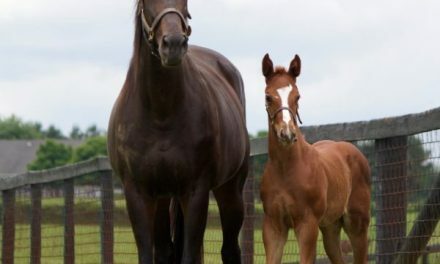 Livermore) was declared America’s Most Wanted Thoroughbred, Maryland horses and trainers continued to show success with several top-ten placings. In addition to those listed earlier in this article, Maryland horses also placed in Polo and Competitive Trail. In Polo, Neil Agate’s Demon, a 2009 chestnut mare by Devil His Due out of Hill Top Honey (New York-bred) placed fourth overall. Agate was also awarded the top-placing amateur trainer award for the Polo division. Agate has been involved with several RRP projects and makeovers but this was his first time participating as a trainer. Demon was not Agate’s first choice for the Makeover as he had been working with a gelding named Greatness Secret for several months before the horse aggravated an old injury and needed six months off for recovery. In September, Agate reached out to his fellow polo trainer friends and Liv Stringer leased him Demon, who she had previously started retraining in the spring but then did not have much time to put into the mare. “To make a long story short, four days later, Liv delivered Demon to the field at Capitol Polo Club and I took her home to begin a very short period of training,” Agate stated. Neil Agate of Capitol Polo Club (Poolesville) and Demon finished fourth in Polo with Neil earning the Top Amateur Trainer Polo award. Agate went on to say that where she really shined was in the three-on-three demonstration match, which because of how green she was, he was originally going to skip. “In the short match she showed me that she had the polo instinct that you just can’t train a horse to have. She went straight to the ball, turned quickly when the direction of play changed and pushed back when one of the other competitors bumped her.” Agate was so happy with her performance that he brought her back to Maryland instead of sending her back to Stringer’s Aiken-based facility. Beverly Strauss had intended to bring five horses to the Makeover this year and enter the hunter and jumper classes but a few of the ones she had selected had already been adopted through MidAtlantic Horse Rescue. “Most of the horses that we entered originally all got adopted. We did not want to keep a horse from getting a new home because we were in the Makeover,” she explained. So when it was time to ship to Kentucky, she chose to bring Glancing Blow (by Langfuhr out of Mingling Glances by Woodman), A Miracle’s On (by In A Walk out of My Foriels On by My Mike) and Go Liberty Go (by Griffinite out of Clear Pouch by Pembroke). “We knew we were behind in the training because of choosing our horses so late so we opted to do the trail, planning to have a fun hack around the Horse Park,” she stated. The atmosphere of the Kentucky Horse Park affected her horses but she still felt the horses performed well. “Liberty was so stressed hacking to the start of the trail that I withdrew him,” she said. “The other two went on and loved the course. They really settled out there and did a great job. Even dragging a log, which we had never practiced!” Glancing Blow finished ninth while A Miracle’s On placed tenth.